So, there is yet another twist in the long-running Southern dispute. Aslef, the drivers' union, is recommending its members accept a revised deal which includes a big multi-year 28.5% pay deal. It would take earnings from £49,000 to £63,000 for a 35 hour, 4 day week. You'd think drivers would accept a pay increase like that? Not necessarily. Aslef has already put two previous offers to its members. Both were rejected on safety grounds and driver concerns over Driver Only Operation (DOO). The members have serious misgivings over being in charge of dispatching the trains and closing the doors. Both used to be the job of the guard whose role has been changed. The last time a deal was put to members it was very close; 48.2% voted to accept, against 51.8% on a 75% turnout of 953 drivers. Yet again, the devil will be in the detail and whether enough has been done to satisfy drivers' concerns over safety. Aslef says: "We will have a second safety-trained person on every train covered by this agreement except in exceptional circumstances. That person will have all the relevant safety competence including the skills to evacuate passengers in an emergency." I'm told the number of "exceptional circumstances" has been reduced since the last ballot but we don't know what they are. However, the wider picture is the RMT - the guards union - has held more than 30 days of strikes on Southern and has also voted to strike on South Western. It is not involved in this deal. The RMT's position is it will not agree to running trains without two staff members under any circumstances. So as its dispute spreads, you'd expect it to continue to oppose DOO. Unless the RMT is happy, some have said to me many Aslef drivers won't accept this deal. Many of the passengers I've been in touch with just want an end to this and to get a decent service back. Some have expressed concern the pay rise might increase fares. Actually Southern is under a management contract - in effect Govia Thameslink (GTR) collects revenue for the Department for Transport (DfT) for a fee. 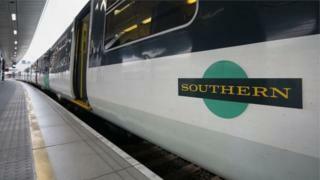 So fares on Southern are even more under the control of Government than other franchises. Any changes to fares would have to made at the Department for Transport and in the current climate extra fare increases are not exactly politically desirable.